TwinSpires Blog: What’s In a Name? Over the past week, my friend and colleague Ed DeRosa has written extensively about Eblouissante, the three-year-old half-sister to Zenyatta. At the heart of his writings was one simple question: Would Eblouissante offer value in her debut or would the Zenyatta connection assure that her price was lower than a pair of pants at a skate park? In the end, Ed concluded that 7-5 was more than fair on a filly that he felt had a 50-50 shot of visiting the winner’s circle and, judging by Eblouissante’s convincing 4 ½-length score, he was right. But it got me to thinking (something I like to do when I’m not keeping up with the Kardashians): Does it make economic sense to follow and play horses that even casual players are aware of and, therefore, more likely to bet? I decided to do a little — emphasis on little — study to find out. 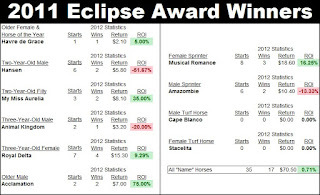 Below is a table that includes all the 2011 Eclipse Award-winning thoroughbreds (minus Black Jack Blues, who was voted best steeplechaser) along with their pari-mutuel performances thus far in 2012. 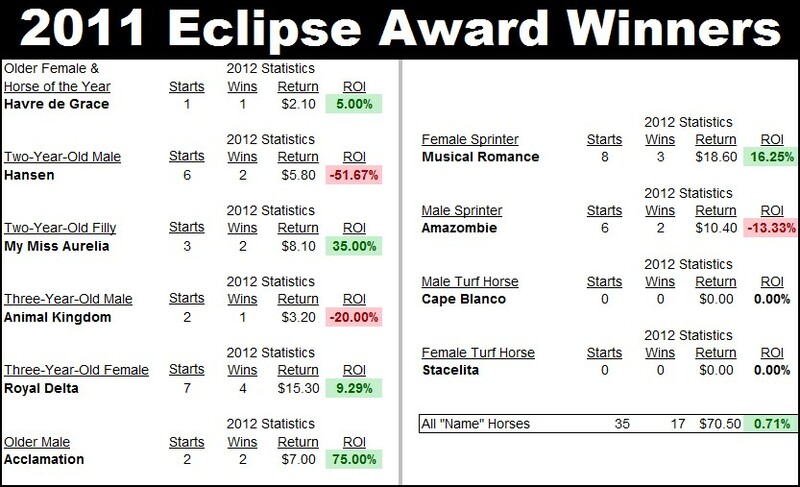 I figured if any group of animals could be considered “name horses,” recent Eclipse Award winners fit the bill nicely. The results, as one can see, are somewhat ambiguous. While last year’s champions have certainly outperformed the average thoroughbred running for a tag at Aqueduct on a Thursday afternoon, they have not exactly been cash cows. Havre de Grace, Hansen, My Miss Aurelia, Animal Kingdom, Royal Delta, Acclamation, Musical Romance and Amazombie have combined to win 17 of 35 starts this year. A $2 win bet on each of them in those 35 races would have resulted in a profit of — drumroll please — 50 cents. That’s right, two quarters... five dimes... 10 nickels... you get the picture. Mind you, this is better than one could expect betting a bunch of random no-names or even favorites, but it is hardly the stuff of legends, which brings us to Saturday’s Cigar Mile Handicap at Aqueduct. Among the entrants in that Grade I event is Groupie Doll; the same Groupie Doll that won the Breeders’ Cup Filly & Mare Sprint by 4 ½ lengths. The same Groupie Doll that is a lock to win the Eclipse Award for top female sprinter. Now, contrary to my recent betting opinions of her, I like Groupie Doll. I think she’s a tough and talented filly and the deserving female sprint champion, but that doesn’t mean I think the daughter of Bowman’s Band is worthy of a bet at any price. Personally, I wouldn’t take less than 2-1 on trainer William Bradley’s stable star in the Cigar and, given her reputation, I think such a price is probably a pipe dream. I feel likewise about another “name horse.” Although Stay Thirsty has not won an Eclipse Award (and isn’t likely to), many fans are still aware of him thanks to his high-profile connections. Owned by Mike Repole and trained by Todd Pletcher, Stay Thirsty is coming off a game second in the Jockey Club Gold Cup on Sept. 29 and also has a win in the Grade I Travers on his resume. But Stay Thirsty is a plodder. Definitely not the kind of horse that I think will relish turning back to a mile at this stage of his career. The horse I’ll be taking a long look at in the Cigar Mile is Buffum, a four-year-old Bernardini colt owned by Godolphin Racing. Buffum has run some of his best races at a flat mile and comes off an impressive wire-to-wire score in the Grade III Bold Ruler at seven furlongs. I think he could be on the engine again Saturday and he could prove tough to overhaul in a race without a lot of strong late runners. Plus, I’m guessing Buffum’s price will be a lot more generous than the price on either Groupie Doll or Stay Thirsty. And value, my friends, is the name of the the game — the only name that counts. AQU6: To say that 1-UNLIMITED BUDGET’s debut was impressive is akin to calling the Rocky Mountains “hills” — a gross understatement. Not only did the daughter of Street Sense win by 9 ½ lengths on Nov. 9, she recorded a -14 early speed ration (ESR) in the process. Unlimited Budget ran so fast early that day that she left the 1-2 favorite Brilliant Jewel, who was coming off a second-place showing behind 2-EMOLLIENT (today’s morning-line favorite) in her lifetime bow, gasping for air even before the field turned for home. What’s more, Unlimited Budget earned a -7 late speed ration for her maiden score — just a couple ticks slower than Emollient recorded in her maiden victory. AQU7: In a race that could feature a fairly hot pace (most juvenile races do), I like the fact that 9-NORMANDY INVASION is a proven commodity from off the pace. I also love the -3 LSR the son of Tapit earned last time. 6-INDY’S ILLUSION sports improving pace figures and should get first run on the early leaders; big shot at a big price. The 1/1A Repole Stable entry of MICROMANAGE and OVERANALYZE can also be used at the right price (5/2 or greater). I’m taking a stand against 4-DELHOMME if he’s a short price (less than 4-1) because I think that last race looks better on paper than it did on the racetrack. AQU8: Will try to beat the “name horses” 7-GROUPIE DOLL and 1-STAY THIRSTY with 3-BUFFUM and 5-HYMN BOOK (see analysis above). AQU9: I’m afraid the morning line tells the story. 2-DANCE CARD has the most talent, but I hate the layoff, while both 6-BOOK REVIEW and 7-MY WANDY’S GIRL look like viable alternatives.